Fabienne from The Unofficial Apple Weblog has some suggestions on rack-mounting Power Mac G5s and other Macs. 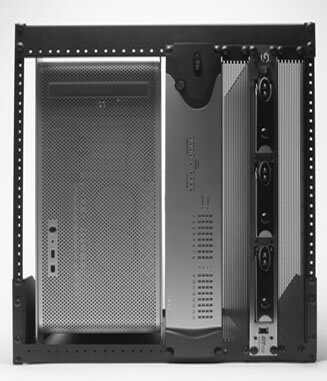 She points to the Redco Audio Vertical Rackmount Frame. Yes, this one is a vertical frame, but it’s designed to fit other hardware like the Digi HD hardware shown here. Looks like a better solution for studios than it is for road-racking, unless someone can suggest a way to make it road-ready, but that’s partly a function of the size of the case. At US$149 it’s a fantastic bargain for any Power Mac owners; I’ll probably have to get one! Fabienne also suggests epoxy or hot glue for rackmounting smaller products (like a Mac mini) to shelves. Thanks!